Natural light cascading in from skylights creates a welcoming ambience in any home. However, its constant presence can cause problems when heat, glare and UV rays are admitted, or when you require the room to be darkened. 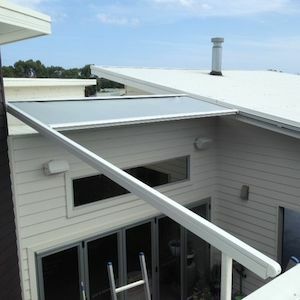 The Issey MaxiZip Series is a sophisticated, retractable roof for conservatories, courtyards or custom-built structures with compact and aesthetic looks. The tensioned system ensures taut fabric and resistance to high winds while giving smooth operation. Issey has created flexible variations of the Issey MaxiZip to suit a wide range of sunroom structures and requirements. With European components, combined with local design, manufacture and installation we provide you with the "best of both worlds" in function and form. A range of practical optional weather sensors makes the motorised MaxiZip easy to operate conveniently while extending its lifetime when fitted with the sun, wind or rain sensor. A wide choice of fabric is available to suit your unique situation. Screen 86% / 90% / 92% / 93% - When you have a beautiful view, selecting screen fabric will ensure the majority of heat, glare & UV are prevented while the view is maintained. Acrylic 99.5% - A higher block-out factor may be required when maximum heat control or privacy is essential.